Cocoa butter is an essential ingredient in chocolate. It is extracted from a portion of cocoa beans and mixed together with another portion of cocoa beans along with sugar to make chocolate. It makes the chocolate creamy and mouth melting. The cocoa butter press and was invented by Coenraad Van Houton in Holland in 1828 but simple, small cocoa butter presses are no longer manufactured. Large-scale, very expensive and energy intensive presses are the only ones available these days. 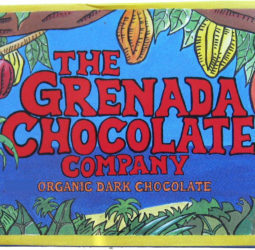 Therefore, GrenadaChocolate had to design and build our own small-scale simple cocoa butter press. The challenge in cocoa butter pressing is achieving huge pressures. Industrial presses use as much as 6000 psi, requiring over a hundred tons of hydraulic pressure pushing on a press cylinder. 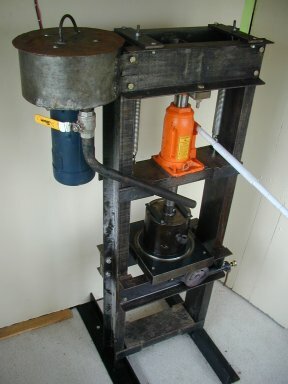 Our press uses much lower pressures like the old-style presses and provides about 1500 psi using a standard 20 ton hydraulic car jack. Our press cylinder is machined out of standard seamless pipe stock (6 inch diameter) and sits on a 2 inch thick steel press plate which contains small holes and a fine stainless screen. As a steel piston pushes down on the liquefied cocoa inside the cylinder, clear liquid cocoa butter squirts and drips out of the bottom of the press plate and into the collection bowl. The piston needs to be re-pressurized every few minutes by cracking the jack a couple of times. It takes about 45 minutes to complete each batch in the press. The press is continually heated using attached gas burners. After the butter stops dripping out, the cylinder is removed from the press plate and a block of cocoa solid material is removed. This block is ground down to make our wonderfully rich Cocoa Powder, used for hot chocolate, baking, chocolate ice-cream, etc. The cocoa butter is added to the chocolate in the Conche so that it mixes in thoroughly and becomes one with the chocolate mass. Our press takes time and patience to operate but produces a special extra-flavorful cocoa butter that helps give our chocolate an extra rich chocolatiness.